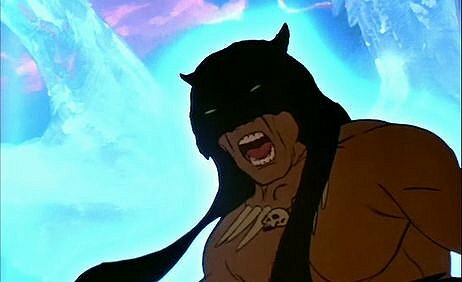 FIRE AND ICE is a 1983 collaboration between animator Ralph Bakshi and fantasy artist Frank Frazetta (who drew those awesome Conan covers), based on the technique of rotoscoping, where directors first shoot scenes in live action and then trace animation cells onto the film. It's the same technique Bakshi used in his 1978 adaptation of THE LORD OF THE RINGS, though things run a bit smoother here. 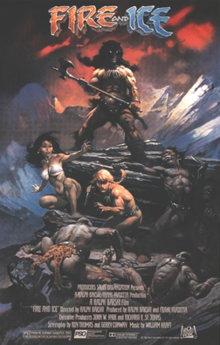 FIRE AND ICE takes place in a "hyperborean" fantasy world that recalls Robert E. Howard's CONAN books, to a degree. There are bronze age cities where people (mostly) wear clothes, and stone age villages where people (exclusively) wear loincloths. A few people have magical powers. Others get to ride pterodactyls. As the film begins, we're introduced to two warring kingdoms: Fire Keep (where good guys like Sean Connery King Jarol and g-string wearing Princess Teegra live) and Ice Peak (where evil sorceress Queen Juliana and her even more evil son Nekron live). Fire Keep is mostly populated by homo sapiens sapiens, and Ice Peak by homo sapiens neanderthalenis, though both Queen Juliana nor Price Nekron are also the former. Action begins with the destruction and massacre of a peaceful agrarian people by Ice Peak, and a plot by Queen Juliana to kidnap Princess Teegra. She escapes, and in the jungle that separates Ice Peak from Fire Keep, she meets loincloth-wearing Larn, the sole survivor of the massacre. Larn tries to help her escape from the evil neanderthals, but they prove crafty, while Nekron moves his glacier ever closer to Fire Keep. A confrontation brews, one that will only end with the death of the malignant Nekron or the total destruction of Fire Keep and everything good in the world. There's a lot to recommend in this film. For one thing, the animation has a sort of THUNDARR THE BARBARIAN-but-good feel to it. For another, it relies more on suspense than action and exposition, with a result so thrilling you inevitably wonder why more fantasy films don't take this approach. The music is atmospheric and does a great job heightening the tension--as does the relative lack of dialogue. Yet you still feel as if you know the characters and understand the world. It's economic storytelling, and very effective. And then there's just cool stuff like the freaky woods witch and her troll son. Or Cat Dude, who lives in the jungle and is awesome. He wears a panther skin and is impervious to magic. He can kill 15 evil neanderthals with his axe by the time anyone else kills 1, and he really hates Nekron. But that's not the best thing about Cat Dude. No, the best thing about Cat Dude is the fact that, despite wearing a panther skin, living in a tropical jungle and generally comporting himself like an enraged tiger, his name is actually Darkwolf. Because wolves are awesome. That said, there are a lot of important questions the film fails to answer. Like, why is Cat Dude named after a wolf? And why aren't people dressed more weather-appropriately? I mean, I can understand why you might choose to wear a loincloth or g-string in Fire Keep or a tropical jungle, but inside a glacier? Only Cat Dude bothers to bring something warm, and he wears it like a cape. Finally, and most importantly, why have I never seen this film before??!!??? Bonuses: +1 for OMG a fantasy film that's actually cool and good and not stupid and annoying; +1 for suspenseful approach, heightened by atmospheric music and economical use of dialogue; +1 for Cat Dude, aka Darkwolf. Penalties: -1 for all the non-Teegra people from Fire Keep being kind of lame and annoying. Cult film coefficient: 9/10. This is awesome, and ridiculous, which makes it ridiculously awesome. SUBMISSIONS: Write a Guest Post!